Goodreads: Johnny Locker is the leader of a massively popular movement to overhaul the nation's Social Security system. Unbeknownest to him, another movement is in place - and this one's much more dangerous. A charismatic military hero has a plan to overthrow the entire governmental system and replace it with one more closely based on the Constitution. And he wants Johnny's help. Johnny is quickly swept up in the general's big ideas, but he soon realizes that the new leader is just as corrupt as the old. With the support of other dissidents, Johnny finds himself once again leading a grassroots movement that will reshape the nation. He has always been a bit of a rebel, but to answer freedom's call, he must also become a revolutionary. Kritters Thoughts: A sort of dystopian with a twist - a new type of government needs to be established as the current government has grown too big and is completely corrupt. An interesting book to read at this time when people may be thinking that our government has become too big and has gained too much control. As we enter an election year, this book is something that some may want to read before they pick the candidate that they choose. 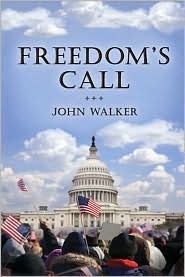 This book was short and simple - a movement was under way when the government "intervens" and the Chinese attack Washington, D.C. Without giving away this short story, Johnny Locker is the center of the movement and then becomes the center of the new government. If you like a little conspiracy mixed with the political world, this would be a book worth picking up.